Our owners are always trying to provide the BEST CARE for us… so when they hear about something that might be good for us, they naturally want to know more about it! Coconut oil is one of those things that people in the doggie industry are jumping on and trying to add into their products… either by coconut oil alone, or by adding it into snacks. But what is so great about it? Some people call it a “miracle in a jar” due to all of the beneficial properties that it can provide to your furbaby. But what is it really? And what can it do? Coconut oil is a medium-chain fatty acid and is used immediately in the body as energy without circulating into the bloodstream as fat… and since it is not from an animal source, it contains no cholesterol. Medium chain fatty acids put less strain on your pancreas than other fats and are easier for the body to digest…. this goes for doggies AND humans!!! Coconut oil can help your little furbaby fight off germs due to the Lauric acid that it contains. Lauric acid is known for its anti-bacterial, anti-viral and anti-fungal properties, so it can actually kill harmful bacteria, viruses, yeast, fungi and parasites. It can stimulate the immune system and acts as an anti-inflammatory. It can even kill ear mites!!! If your baby is a tad bit overweight, adding this to his diet can help to improve the thyroid function. It also improves skin and coat texture from the inside out!!! Do your baby’s paws smell like Fritos? Do you know that this is the sign of a yeast infection??? Are their ears always dirty and are they always scratching at them? That is another sign of a yeast infection…. a condition called Candida. Coconut oil can be used to get rid of Candida if used regularly. Many owners have said that using coconut oil in their baby’s food daily cleared up the tear staining problem that had plagued them for years! Does your baby have poor digestion? This means that they aren’t really absorbing all of the good nutrients in the food that you are giving them. Coconut oil helps to IMPROVE the absorption of these nutrients into the bloodstream by improving the good gut bacteria in their intestinal system. If your pup has a lot of bowel issues, they most likely have inflamed and damaged intestines. Coconut oil is an anti-inflammatory and with a little bit added daily to their food, it is possible they could see some relief with its use, but always check with your vet. Let him know that YOU have been doing some RESEARCH and you KNOW STUFF NOW!!! When using coconut oil, remember that they are not all created equal!!! There are cheap versions just like everything else out there. You want to make sure that the one you choose is: RAW, ORGANIC, and VIRGIN. Try and make sure that it is also packaged in a glass jar, and not plastic… which can leak substances into your coconut oil over time. In the end, you will pay more for the higher-quality oils that you want to use. The daily maintenance dose of coconut oil is 1 teaspoon of oil (Mummy always melts ours and drizzles it over our food to make it easier) per 10 pounds of body weight… given in divided doses if you feed twice a day. Or 1 Tablespoon per 30 pounds of body weight. You should always start with the smaller weight and then gradually increase the dose as you see they tolerate the oil without any difficulty. We have never had any problems whatsoever. If your baby has been exposed to an infection, you can DOUBLE the dose. Make sure that you give extra fluids to help flush out the toxins from their bodies. But, not only can you provide them with coconut OIL… you might not know that you can also feed your pup FRESH coconut meat or dehydrated coconut… like the COCONUT CHIPS from CocoTherapy that I sell in my on-line BOUTIQUE. We love these things and Mummy will give us a few slivers as a treat but she also crumbles a little up and sprinkles it on top of our dinner too. Fresh or dehydrated coconut provides the same health benefits as coconut oil. If you do choose to buy COCONUT chips or flakes that are prepackaged, make sure that they are RAW (like the ones that we sell from CocoTherapy) and do not contain salt, preservatives or sugar. The dehydrated coconut flakes that you see in the grocery store are NOT raw. They are dried at a high temperature and have preservatives, chemicals or sugar… do NOT use those!!!! The ones from CocoTherapy are made for pets but humans can eat them if they want to! CocoTherapy even makes a little macaroon treat that contains coconut! They have come up with several ways to get COCONUT into our lives because they realize the benefits of this big NUT and want to help us start getting a healthier boost from our food! 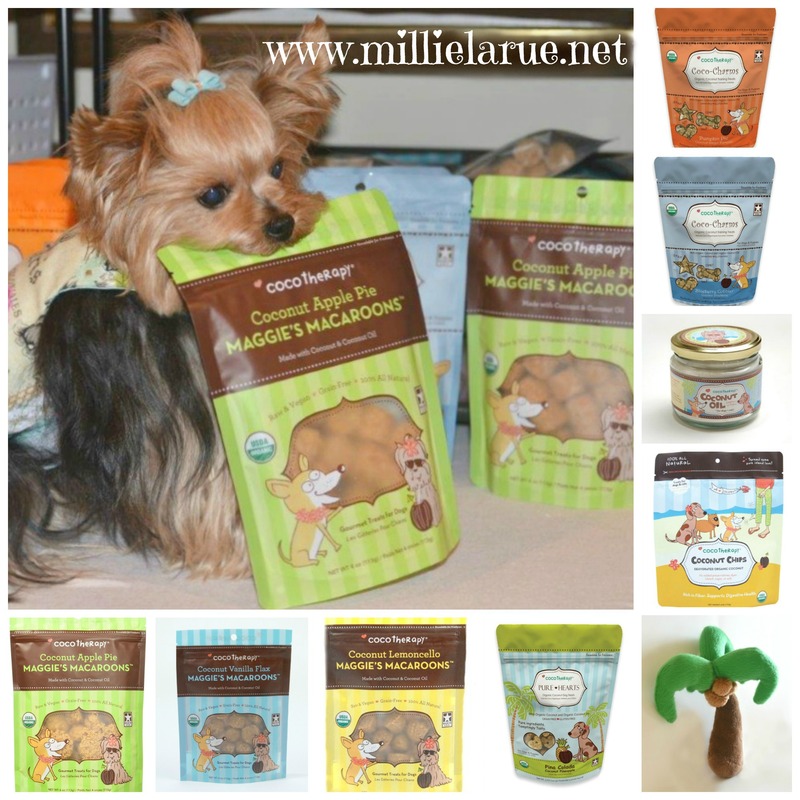 We have coconut oil, coconut chips and little coconut doggie treats available through our on-line BOUTIQUE, all from CocoTherapy, because we TRUST the way they make their products. We even have a tiny little coconut tree stuffie that is perfect for gentle chewers!!! The coconut is truly, NATURE’S MEDICINE!